A story about sharing and siblings: What are You Doing Benny? by Fagan and Denton – Joyce's mystery and fiction book reviews with some non-fiction too! This picture book shows two foxes; I did not realize initially that they are brothers, although they are. 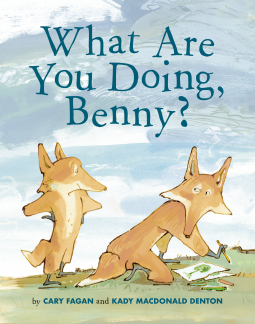 Benny, the older fox, is having fun doing many different activities. Whenever the younger (nameless) fox asks to participate, he is told no. This happens repeatedly, in my opinion a few more times than needed for the sake of the story, although the illustrations are fun. Eventually the younger fox begins to play on his own although he continues to follow Benny a while longer. After a time, the two foxes begin to share and play together in an activity initiated by the younger. This story shows the persistence of the younger fox and the older fox’s focusing on himself, not others. The ending, in which, Benny enters into an activity with his younger brother is meant to, at least temporarily, resolve their conflicts. Younger siblings will most likely relate to being pushed away by their elders. Older siblings will be reminded of how hard it is when a younger brother or sister wants their attention. This is all fine but what I slightly quibble with is the persistence of the younger sibling. He might be viewed a bit as a victim, rather than as a child who has some resources of his own. Nonetheless, this may be a good story book to read with children of any birth order. Thanks to the publisher and NetGalley for this advance read. Opinions are my own.